Graduates of Oak Knoll enjoy automatic membership into the Oak Knoll Alumnae/i Association. This membership offers a lifelong connection to their school. 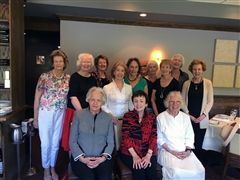 Oak Knoll encourages alumnae/i to keep in touch, to celebrate Reunion each spring, attend special events at school and regional events in their area and to remember Oak Knoll with their financial and volunteer support. Oak Knoll alumna Jennifer Spottz ’15 will perform “How Far I’ll Go” from “Moana,” the 2016 animated Disney film, as part of the “Broadway Princess Party” at the New Jersey Performing Arts Center this Saturday, September 15, at 7 p.m.
Just days before Christmas, members of the Oak Knoll School basketball and swim teams joined together for a special charity spin class that raised $600 to benefit the Maureen Ellinwood Pluvinage ’99 Scholarship Fund. Oak Knoll School of the Holy Child alumna Amalia Duarte ’80 was elected to the Mendham Township Committee on Tuesday, the latest instance of Duarte embracing the leadership roles once experienced at her alma mater. Oak Knoll School alumna Elizabeth Countryman ’96 has written a book of poems, “A Forest Almost,” which is already garnering critical praise in advance of its November 15 publishing. Doris ‘Deb’ Zolper died on April 1, 2019. She was the mother of the late Suzanne Zolper ’70 and Stephen Zolper who attended the Lower School. Morna Ford Sheeny ’60 died on March 21, 2018. Rest in peace, Morna. Kathryn Wade ’03 welcomes daughter! Cathleen Mallaney, who died on Feb. 7, 2019, was the mother-in-law of Grace Magnier Mallaney ’83, grandmother of Norah Mallaney ’04, Clare Mallaney ’10 , Mary Mallaney ’15, Ryan McCarthy ’14 and Allison McCarthy ’18. Jack McDermott passed away in October 2017. Jack was the father of Margaret (McDermott) McCafferty ’76 and Caroline McDermott ’78, and grandmother to Kathleen (McCafferty) Rathbun ’08. Colleen McFadden Dudek ‘81 passed away on January 11, 2019. After graduating from Oak Knoll, where she was a standout field hockey player, Colleen earned a finance degree from the University of Richmond. She enjoyed a successful career before becoming a full-time mother to four children. Eileen McCormack, who died on January 3, 2019, was the mother of Eileen McCormack Harte ’73, trustee emeritus; Catharine McCormack Totman ’80, Mary McCormack Giles ’84 and grandmother of Catherine Harte ’08. Ellen Carlin Long ’52, who died on December 31, 2018, was the mother of Ryan Martin Ungrady ’80, mother-in-law of Elizabeth Mortenson Martin ’80 and grandmother of Casey Martin ’20. The longtime Union resident was also a graduate of Marymount College in Tarrytown, New York. Julia Harrison ’61 died on December 25, 2018. In addition to being an Oak Knoll alumna, she was also a graduate of Rosemont College. She served as a project manager in computer science for Convergys Corp. in Union, and is survived by nieces and nephews, as well as grandnieces and grandnephews. Maria Teresa “Maritere” Luzarraga, who died on November 8, 2018, was the mother of Maite Luzarraga Albanese ’82. Viola Luciano, who died on November 16, 2018, was the grandmother of Ali Sumas Good ’95, Christina Sumas ’98 and Laura Sumas Barry ’03. She was also the great-grandmother of Lea Good ’23. Tricia Bender Trego ’73, who died on November 22, 2018, was the sister of Alice Bender Gibbons ’76 and Peggy Bender Gillen ’78. She was also the aunt of Tara Leone ’96, Andi Gibbons Hubschmann ’02, Lara Gibbons Herr ’06, Tommy Gibbons ’03 (LS) and Matthew Gibbons ’06 (LS). Robert Gardiner, who died on November 3, 2018, was the husband of Elizabeth Walker Gardiner ’55. Alyssa Small Blatt, who died on Dec. 11, 2017, was the sister-in-law of Melissa Blatt ’97 and cousin of Ali Sumas Good ’95, Olga Anagnostis ’07, Christina Sumas ’98, John Anagnostis ’98 (LS) and Laura Sumas Barry ’03. Kasia Borowiec ’08 recently played the lead role in “Madame Butterfly” at the Tri Cities Opera in Binghamton, New York. The Hon. James Haggerty, who died on November 10, 2018, was the father of Marianne Haggerty ’75, Meg Haggerty Gaul ’76 and Sally Haggerty Mulcahy ’78. Dennis Buchert, who died on November 4, 2018, was the father of Carolyn Buchert ’95. Please remember Miriam Burgund Hoddinott Sayres ‘48, who died on June 30, 2018. Rest in peace, Miriam. Robert Tansill, who died on Nov. 3, 2018, was the father of Mary Beth Tansill Childs ’74 and Patricia Tansill Post ’80 and grandfather-in-law of Oak Knoll Athletic Director Kelly Childs. Vincent A. McInerney, the brother of Laurelle McInerney ’10, passed away on Oct. 26, 2018. In Memory of Edward James “Teddy” Bonner, Jr.
Edward James “Teddy” Bonner, Jr., brother of Ann Bonner O’Brien ‘96, who died on October 23, 2018. Please remember Mary Alyce Kane Hurley ’64, who died on March 29, 2018. Thomas L. Kempner, who died on October 9, 2018, was the was the husband of Ann Bernhard Kempner ’66. Celima Dias, who died on October 16, 2018, was the grandmother of Evan Dias-Sotiriou, with the Class of ’18 (LS), and Carolina Dias-Sotiriou, with the Class of ’25. Richard Billera, who died on October 7, 2018, was the husband of Helene Billera, former Oak Knoll English teacher. He was also the father of Elyse Billera ’84 and Donna Billera ’80. 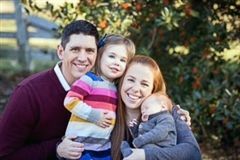 Meghan Rafferty Hakanson ’02 welcomes daughter! Meghan Rafferty Hakanson ’02 welcomed into the world Hadley Grace Hakanson on September 28, 2018! 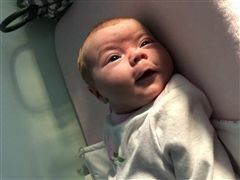 Hadley Grace was born weighing 9 pounds, 9 ounces and mom reports she is thriving! Celima Dias, who died on October 16, 2018, was the grandmother of Evan Dias-Sotiriou, with the Class of ’18 (LS) and Carolina Dias-Sotiriou, with the Class of ’25. Charles Topping, the father of Upper School theology teacher and Campus Ministry member Brian Topping, passed away on October 16, 2018. 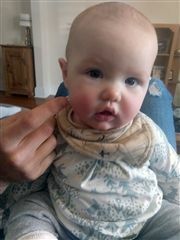 Charles Topping was also the grandfather of Lizzie Topping ’10, Jack Topping ’11 (LS) and Anna Topping ’25. Justin Imperatore, who died on October 2, 2018, was the brother of Augusta Imperatore '18. Bernard Speckhart, who died on September 9, 2018, was the father of Mary Speckhart ’77, Donna Speckhart Smith ’78 and Patricia Speckhart Woods ’82 and grandfather of Madeline Smith ’12 and Madeline Smith ’12. Katherine (McCullough) Lewis ’09 recently married Billy Lewis at the Church of St. Ignatius on the Boston College campus, with a reception at the Boston Harbor Hotel. In June members of the Class of 1961 held a mini summer reunion over lunch at the Water & Wine Ristorante in Watchung. Ann Porter ’08 married Josh Loigman on July 7, 2018, at the Mohonk Mountain House in New Paltz, New York. The couple met at George Washington University as first-year law school students, according to a New York Times article about the nuptials. Elizabeth “Beth” Howells Murphy ’66 passed away on June 10, 2018. Rest in peace, Elizabeth. Claire Ducey Kenney, who died on June 16, 2018, was the mother of John Kenney, trustee emeritus, and grandmother of Mary Margaret Kenney ’14, Grace Kenney ’14, Evelyn Kenney ’14, John Kenney, Jr. ’08 (LS) and Angela Kenney ’18. Dr. Joseph McDonald passed away on May 26, 2018. Dr. McDonald was the father of Colleen McDonald Bronander ’88 and Ann McDonald ’95. Dr. Robert O’Driscoll, who passed away on May 14, 2018, was the father of O’Driscoll Adelhelm ’84 and Lori O’Driscoll Marchesi ’90. He was also the grandfather of Elizabeth Adelhelm ’19 and Claire Adelhelm ’21. Kathleen Sexton ’66, passed away in December 2018. She was the sister of MaryAnn Sexton Smith ’64. Mary Dos Passos Singleton ’37 passed away on April 27, 2018. Joan Stewart Goebel ’46 who died on February 10, 2018, and is survived by her seven children: a brother, ten grandchildren, numerous nieces and nephews and many friends. In lieu of flowers, the family suggests contributions be made to Alzheimer's and dementia research through the Alzheimer's Association . Beverly Suzanne (Ingate) Davie ’60 passed away on January 28, 2018. She is survived by two children and six grandchildren, as well siblings, nieces, nephews and cousins. In lieu of flowers, donations in Beverly’s name may be made to: The Woman’s Club of Chatham, P.O. Box 675, Chatham, NJ 07928 or Independent Thrift Shop of Madison, 33 Kings Rd., #2, Madison, NJ 07940. Katie Pesce Magnum ’02 and her husband William Lyons Magnum welcomed son Finn William Magnum into the world on October 6, 2017! Big sister Mollie is thrilled with the new arrival! Clinton Brown, who died on January 16, 2018, was the son of Jeanne Brown, former science teacher in the Upper School. Scott Boyll, who died on January 7, 2018, was the husband of Jeanine Matheu Boyll ’76. Katie Cummings ’03 married Kyle Siegfried on Sept 30, 2017, in Nantucket, Massachusetts, at the Nantucket Yacht Club. Joining Cummings on her special day were Laura Sumas Barry ’03, Laura Hefferan ’03, Kaitlin Hespos ’03, Taylor DiGiacomo Plastiras ’03, Mary Cummings ‘07, Jackie Bertolini Chase ’03, Kate Burgess Sondossi ’03, Katherine Giaccio Mooney ’03, Katherine Schaumburg Gargiulo ’03 (married to Peter Gargiulo, LS ’00) and Genny La Paglia ’03. Marguerite (Keenan) Conrad ’47 passed away on November 25, 2017. Please pray for Marguerite’s family, friends and classmates. Rest in peace, Marguerite. William Reed Chisholm, who died on Dec. 17, 2017, was the father of Ruth Ann Chisholm Fleming ’76 and Beth Chisholm MacDonald ’77. Charles Stanley, who passed away on November 30, 2017, was the husband of Phyllis Duffy Stanley ’62. Brielle Hunt ’07 married Alex Maffett on October 14, 2017, in Richmond, Virginia. Fellow alumna and sister Aubrey Hunt ’11 was in the wedding, while classmates Jacqueline Gabela ’07 and Lauren Masini ’07 were also in attendance. Hunt and Maffett both attended the University of Richmond and reside in Virginia’s capital city with their golden retriever, Paisley. Hunt is a medical malpractice attorney while Maffett is a financial advisor. We're saddened to share the passing of Augustine “Gus” Pushparaj, trustee emeritus, who died on October 16, 2017. For more, click here to read his obituary. Dr. Allison Adams ’81 has been chosen as the top dentist of 2017 by New Jersey Monthly Magazine. Adams also recently opened an Integrative Dental Center at her office to address more comprehensive health and illness prevention that are tied to dental care, such as airway and breathing issues in adult children. In Memory of Maureen Ellinwood Pluvinage '99. We're saddened to inform you all of the passing of Maureen Ellinwood Pluvinage '99. Please keep Maureen's family in your prayers. Our condolences go out to her family, friends and classmates. For more information on her life and arrangements, click here and to To donate toward her memorial scholarship visit www.oakknoll.org/ellinwoodpluvinagefund. Betty Ann Nothiger Toy ’60 passed away on September 23. Rest in peace, Betty. 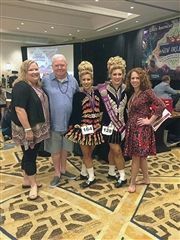 This summer, Teresa Drew finished fifth among ladies 22 and over in the North American Irish Dance Championships held in New Orleans! Good luck at the World Championships later this fall! Barbara Ward, who died on September 17, was the mother of Mary Ward ’85 and Andrew Ward ’82 (Lower School). Lether L. Hayes passed away on July 10. She was the grandmother of Adama Sheppard Brennan ’94, and also once served as our school nurse. John Kellenyi, who died on July 2, 2017, was the father of Cristina Kellenyi ’04. A mini Oak Knoll Lower School reunion took place Friday following a soccer matchup between Notre Dame and Boston College. Pictured, from left, are Brendan Lawlor ’10 and Tommy McCabe ’10! Brendan currently attends Boston College while Tommy plays as a midfielder for Notre Dame! Catherine Cambria, who died on June 27, 2017, was grandmother of Catie Cambria ’02, Jean Cambria ’05 and Lucy Cambria ’08. Lauren Dolecki ’07 married Michael Kober on June 10, 2017, at Church of Christ the King in New Vernon. The couple met as students at Georgetown. Dolecki is a litigation associate at Debevoise & Plimpton in New York. Peter Yerkes, who died on June 25, 2017, was the father of Isabel Yerkes Domiano ’05. Wynne Dillon ’06 married Marshall Nevins in January 2017 in New York City. Joining Dillon on her special day was a bevy of fellow Oak Knoll graduates. 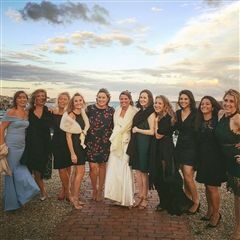 Joining Wynne on her special day was Kaitlin (Vinci) Bierce ’06, Caitlin McGovern ’06, Alyson (Young) De Soto ’06, Caroline Dillon ’13, Charlotte (Dillon) Anderson ’08 and Amanda Brinkerhoff ’06. Mary Lou Davis ’60, died on June 16, 2017. Mary Lou was also the mother of Elizabeth Davis Longton ’81, Meghan Gruchacz ’88. Marjorie McGrath, who died on May 29, 2017, mother of Anne McGrath ’69, Patty McGrath Morris ’71, Laura McGrath Hardin ’74 and Kate McGrath Morris ’76. Maria Isabella Pontoriero ’12 graduated from the Tulane University School of Public Health and Tropical Medicine with a master’s in health policy on May 20, 2017. Dawn Klotz, past parent and past president of the Parents’ Association, died on April 25, 2017. She was the mother of Jessica Klotz ’10 and Jordan Klotz, with the Lower School Class of 2006. Elaine Reinhold Burke, a member of the Class of 1951, died on January 3, 2017. Ann Hubert '00 was recently hired as a tenure-track assistant professor of English at St. Lawrence University in Canton, New York. Robert McTague, who died on May 17, 2017, was husband of Sylvia McTague, Oak Knoll Upper School faculty member, and father of Emma McTague ’19 and Tara McTague ’20. Mary Bernot, who died on March 22, 2017, was the grandmother of Katie Bernot ’06. Dr. Bernard Clark, who died on February 22, 2017, was the husband of Rosemary Gilhooly Clark ’49. In Memory of Richard S. Hester Sr.
Richard S. Hester Sr., who died on January 17, 2017, was the grandfather of Teresa Drew ’12. James La Torre, who died on November 14, 2016, was the husband of Margot Hickey La Torre ’52. Claire Cagnassola ’13 is named NESCAC Player of the Week! Claire Cagnassola ’13 was recently named New England Small College Athletic Conference’s Player of the Week. She earned the honor after scoring six goals and four assists between two Amherst victories. Garrett Hunter, who died on February 11, 2017, was the husband of Lynn Cowell Hunter ’56. Lubomir Jawny, who died on January 25, 2017, was the father of Olha Jawny Sokhan ’81 and the late Tania Jawny Otto ’87. Christine Butchko ’13 has been named a Fulbright Scholar semifinalist at Villanova University, where she is a senior political science major. She is also pursuing minors in business administration, marketing and French! Allison Sayia ’15, a two-sport athlete at Oak Knoll, has been named co-captain of the Villanova field hockey team for the fall 2017 season. Virginia Broderick, who died on January 19, 2017, was the grandmother of Anne Estabrooks Miller ’94 and Michael Estabrooks, Jr. ’96 (Lower School). Katherine Onieal, who died on January 19, 2017, was the grandmother of John Onieal ’03 (Lower School) and Julianna Onieal ’09. Eleanor Shook, who died on January 23, 2017, was the grandmother of Lauren Shook ’11. Bernice Briscoe Mullin in class notes, who died on January 22, 2017 was the mother of Susan Mullin with the Class of 1976, Cathy A. Mullin with the Class of 1968, Carol Mullin with the Class of 1971 and Barbara Mullin with the Class of 1969. Winnie McDonough, who died on December 21, 2016, was the mother of Kathleen McDonough '89. Edward Hopkins, who died on October 19, 2016, was the father of Anne Hopkins ’93. Thomas G. Vinci, who died on November 24, 2016, was the grandfather of Kaitlin Vinci Bierce ’06. Lara Gibbons ’06 married Robert Herr on November 19 at San Marco Catholic Church in Marco Island, Florida. Stephanie Parsons ’53, who died in October 24, 2016, sister of Joan Parsons Tuite ’48, Mary Parsons Doyle ’57 and Barbara Parsons Donohoe ’59. Ellen Commesso, who died on October 21, 2016, was the mother-in-law of Christine Castelo Commesso ’89, and grandmother of Natalie Commesso ’17, Dominick Commesso ’14 (Lower School) and Gabriella Commesso ’24. Maryanita Palmer, who died on October 19, 2016, mother of the late Jacqueline Palmer ’73. Christina Abruzzo ’08 married Anthony Finizio on October 15, 2016 at St. Teresa of Avila Church in Summit. Harold Sivers, who died on October 5, 2016, was the father of Anne-Marie Sivers Mitchell ’90. Amy Elizabeth Pizzi, 37, of Basking Ridge, died surrounded on Sunday, Oct. 23, 2016. 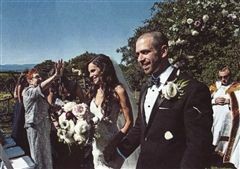 Anna Girard Porges, daughter of Leigh Simon Porges ’75 and J. Randolph Porges, married Conlin Sheridan on October 15, 2016 in East Hampton, New York. Daniel Scuilli, who died on October 1, 2016, was the brother of Sara Scuilli Dullea ’91 and Annie Scuilli Boyd ’95. Andrew Hurley, who died on October 10, 2016, was the brother of Jeanne Hurley Horsey ’90 and brother-in-law of Bonnie Flinn Hurley ’81. Andrew was also the uncle of Jeanne McCormick Horsey ’20 and Sarah McCrea Horsey ’21. Anthony Tamburro, who died on October 7, 2016, was grandfather of Elizabeth Tamburro ’16. Patrice McKee ’71 was a presenter at the American Society on Aging’s national conference earlier this year in Washington, D.C.
Edith “Edie” Budney, who died on October 2, 2016, served as Oak Knoll School’s first professional Alumnae Director. Rose Marfuggi, who died on September 21, 2016, was the widow of Oak Knoll Trustee Emeritus William Marfuggi, mother of Victoria Marfuggi Wagner ’75 and grandmother of Cristina Marfuggi ’00. Don McCabe, who died on September 17, 2016, was father of Melissa McCabe Lagemann ’85. He was also grandfather of Tommy McCabe ’10 (Lower School) and Maggie McCabe, with the class of ’20. Michael Naso, who died of July 7, 2016, was the father of Joe Naso (Lower School) ’03. Michelle Cesan '09, married Brian Duffy on September 10, 2016 in Santa Barbara, California. Michelle and Brian were joined by family and friends, as well as many of her fellow classmates including bridesmaids Lindsay Boyajian ’09 and Ryan Hand ‘09. Eric Brodbeck, who died on September 17, 2016, was the brother of Meredith Brodbeck Kennedy ’96 and the cousin of Sheila Brodbeck Pasic ’90, Lower School math teacher Elizabeth Brodbeck Mercogliano ’94 and Meghan Brodbeck Kim ’99. Sam Gamba, who died on September 9, 2016, was the husband of the late Phyllis Gamba, former Lower School faculty member, and father of Lori Gamba Antonich ’85. Meaghan Brown Del Campo ’05 enjoyed her wedding day September 10, 2016 with several of her fellow Oak Knoll alumnae. Pictured, from left, are Christine Burke Howe ’05, Melissa Santucci Beatrice ’05, Meaghan Brown Del Campo ’05, Caitlyn Brown Boniakowski ’05 and Kelly Rummell ’05. 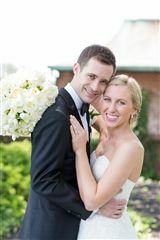 Christine Burke ’05, daughter of Upper School Computer Science Teacher Camille Burke ’77, married Nolan Howe on May 14, 2016. Congratulations! In Memory of Brian Ganton Sr.
Brian Ganton Sr., who died on August 19, 2016, was grandfather of Margo Ganton ’17, uncle of Juliet Moyna Eck ’87 and great uncle of Elizabeth Eck ’22. Catharine Mouquin Weiss ’54, who died on August 20, 2016, was sister of the late Susannah Mouquin Toolan ’46, and grandmother of Jacqueline Weiss ’11 and Laura Weiss ’14. Frank Tondi, who died on August 9, 2016, was father of Sr. Tobie Tondi, a member of the Society of the holy Child Jesus, trustee emeritus and former faculty member. Alexandra Rizk ’10 married Lt. Michael Keane, an United States Naval Academy graduate, at St. Peter’s Parish in New York on Aug. 6, 2016. Rizk, a graduate of the University of North Carolina, currently operates an independent film production company after working as a production assistant for the official VH1 website. Rita Kentz Maher, who died on July 18, 2016, was the mother of Marita Maher Sanchez ’65 and Joan Anne Maher ’68. She was also grandmother of Bridget Maher ’04 and cousin of the late Rita Kentz, former Upper School teacher. Marist Brother Martin T. Ruane, who died on July 8, 2016, was uncle of Norma Delepine, director of Student Support. Blythe Kriete '09, a member of the Class of 2009, married Marko Efstratiou on Saturday, June 18, 2016, in Long Beach Island in New Jersey. Richard Dundon, who died on July 13, 2016, was the brother of Mary Ellen Dundon ’59, a former Oak Knoll trustee. 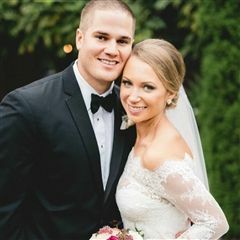 Brooke Conti, with the Class of 2009, married Patrick Trousdale on June 4, 2016. Marjorie “Marge” Magnier Nugent, who died June 7, 2016, was the mother of Mary N. McGovern ’68 and Catherine “Kit” Nugent ’79. Farrell Lynch, who died on June 9, 2016, grandfather of Kathleen Miszkiewicz ’15, Mairead Miszkiewicz ’16 and Grace Lynch ’18. Bernardino Coutinho, who died on June 4, 2016, was grandfather of Emily Goncalves ’16. John “Jack” Williams, who died on May 9, 2016, was the husband of Mildred Selzer Williams ’49 and brother-in-law of Marie Selzer Barkhorn ’49. Maria Isabella Pontoriero '12 graduated from Tulane University's School of Public Health and Tropical Medicine with a Bachelor of Science degree in public health and a minor in economics on May 14, 2016. Gonzalo Rahausen, who died on May 22, 2016, was the husband of Carmen Rahausen, former Oak Knoll School Upper School foreign language teacher. Michael Rosati, who died on April 9, 2016, was the father of Kathryn Rosati ‘02, Elizabeth Rosati ’04 and Margaret Rosati ‘07. Allison Hess, a member of the Class of 2012, graduated May 23 from Boston College, earning a bachelor’s degree in English with minors in management and leadership, Italian and philosophy. Hess was also a member of Phi Beta Kappa, the Order of the Cross and Crown honor society and the Golden Key International Honor Society. Loretta Denman, who died on March 27, 2016, was the mother of Loretta Denman Wolansky ’78 and Nancy Denman Schaedel ’80. Michael Bartos, who died on March 18, 2016, was the husband of Joan Dierickx ‘60 and brother-in-law of Missy Dierickx ‘67. Duff P. Anderson, who died on March 18, 2016, was the father of Stewart Anderson ’98 of the Lower School. Laura (O’Gorman) Schwartz, a member of the Class of 2006, recently published a blog on the Wall Street Journal website. Schwartz is a freelance writer and admission consultant currently residing in Singapore. Irene Hickman, who died on March 15, 2016, was the mother of Trish Hickman ’75, Carolyn Hickman ’86 and Beth Hickman Emerson ’90. Kathleen Wolf Doehner ‘66 died on February 23, 2016. Kathleen was also sister of Patricia Wolf Wagner ‘60. Jose Dominguez, who died on February 1, 2016, was the uncle of Annabela Svorinich, Lower School faculty member. Larysa (Gumowskyj) Kautz ‘12 and her husband Ryan welcomed their son into the world on November 10, 2015. We all wish Teresa Drew ’12 the best of luck as she will compete in the World Irish Dancing Championships next month in Glasgow, Scotland! Teresa will look to improve on her impressive 20th place finish at the championships last spring in Montreal, Canada! John Dolan, who died on January 29, 2016, was the cousin of Sarah Sicari, Upper School faculty member, and Dolores Ashalter, former Lower School faculty member. Ruby Lee Robertson, who died on February 2, 2016, mother of Ruby Robertson-Knox, Upper School faculty member. Elizabeth Miniet '09 married Axel Zwaans in Antwerp, Belgium, on February 15, 2016. Miniet, who graduated from Salve Regina University after finishing her academic career at Oak Knoll, is currently a yoga instructor. Edna O’Connor, who died on September 5, 2015, was the mother of Karen O’Connor Newman ’70 and Susan O’Connor McKay ’73. She was predeceased by her daughter, Peggy Kirk ’66. Emily Gola, who died on January 16, 2016, was the aunt of Suzy Romero, Lower School library assistant. In Memory of William E. Marfuggi Jr.
William E. Marfuggi Jr., who died on January 23, 2016, was the father of Cristina Marfuggi ’00 and brother of Victoria Marfuggi Wagner ’75. Dr. Bart Maggio, who died on January 16, 2016, was the grandfather of Carly Agresti ’09, Lindsay Agresti ’12 and Stephanie Agresti ’16. Frederick von Zuben, who died on January 7, 2016, was the father-in-law of Erin Tighe von Zuben ’90. Catherine Ruane, who died on December 14, 2015, was the grandmother of Erin Ruane ’05. Mary Lou Walsh, who died on May 7, 2013, was the mother of Kathleen Walsh James ’92. Thomas J. Hughes, who died on December 2, 2015, was the grandfather of Oak Knoll students Sean McAloon ’09 and Rory McAloon ’16. Daisy DeCoster ’97 and groom Stuart Horvath were married at Saint Aedan’s Church in Jersey City, on October 3, 2015. Alison Ricciardi ’13 will study abroad at a research center in the Australian rainforest next semester as part of her studies at Bates College in Lewiston, Maine. Ann Di Niro, who died on November 20, 2015, was the great aunt of Alison Ricciardi ’13 and Valerie Ricciardi ’16. Mary Baier '50, who died on November 9, 2015, was the sister of Ann Baier, also a member of the Class of 1950. Catherine Sagurton, who died on November 8, 2015, was the mother of Patricia S. Machir ’70, Claire S. McGuire ’71 and Maureen S. Clancey ’73. Mrs. Sagurton was also the aunt of Margaret Dooley ’92. David Dolan, who died on October 29, 2015, was the brother of Anne Lofredo, Oak Knoll faculty member. Mr. Dolan was also uncle of Alexandra Lofredo ’03. Jurij Ukrainskyj, who died on August 12, 2015, was the father of Motria Ukrainskyj ’78, member of the Oak Knoll Board of Trustees. Marie Magnier, who died on August 14, 2015, was the mother of Regina Matthews ’73, Bernadette Briand ’76, Teri Forand ’78, Grace Mallaney ’83, Michele Sweeney ’85 and grandmother of Joanna Briand ’15 and Ellen Magnier ’16. Nancy Cashel, who died on August 26, 2015, was the mother of mother of Lisa Cashel ’98. Kathryn Murray Dickinson ’90 recently launched a new business – AILLEA – a beauty retail shop specializing in toxic-free makeup, skincare, hair care and fragrance products. Teagan Monaco ’15 and Mary Porter ’14 , both undergraduates at Davidson College in North Carolina, recently had lunch with Oak Knoll Alumna Dana Gusmer Gruber ’83. Dana’s husband, Chris, is vice president of enrollment at the college. The Oak Knoll alumnae had a wonderful lunch together with the Davidson students appreciating Dana’s warm welcome! Julie Myers ’05 and her groom Christoph Teubner were married in a village called Magreid in the Suditrol region of Italy on June 6, 2015. In Memory of Kathleen Cosgrove.